In 1860, the county sheriff arrived at the home of Elizabeth Parsons Ware Packard (1816-1897),took her into custody and delivered her to the Jacksonville, Illinois Insane Asylum. 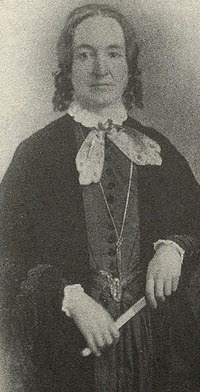 Mother of six children, Elizabeth had been married to Theophilus Packard for many years when she began to openly question her husband's religious beliefs. The couple also disagreed on issues of child rearing, finances and slavery. Her husband declared her insane and committed her to the asylum. Finally, after public pressure, Mrs. Packard was brought out for a jury trial before Judge Starr of Kankakee City; the jury declared her falsely imprisoned, and she was released. In 1863, in part due to pressure from her children who wished her released, the doctors declared that she was incurable and discharged her. Elizabeth headed home only to find that her husband had taken everything, including her children, and left the state. Women were considered the property of their husbands and had no rights of their own. Elizabeth filed suit (Packard vs. Packard) and in the jury trial that followed it took the jury only seven minutes of deliberation to declare in her favor - she was legally declared sane. Following the trial, Elizabeth wrote several books and founded the Anti-Insane Asylum Society. In 1867, the State of Illinois passed a "Bill for the Protection of Personal Liberty" which guaranteed all people accused of insanity, including wives, had the right to a public hearing. She also saw similar laws passed in three other states. Elizabeth was never formally divorced from her husband but they remained separated for the rest of their lives. She remained close to her children and retained their support.